And so begins this literary and pictorial short story for little ones. In the drab bustling city no one notices nor stops to help an injured bird, except young Will, who is partly the source of light and color in author-artist Bob Graham’s illustrations. He and his mom gently wrap the bird in a scarf, take him home, nurse him back to health, and release him into the cityscape. Words are sparse in this book, but the cartoon-styled set up allows for kids to read between the lines and see in detail how the bird is cared for (wrapping the broken wing, providing water and housing). 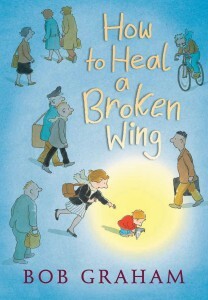 This is such a touching and much needed work in children’s literature, and its premise is basic: see someone in need and lend a helping hand. The storyline lends itself to themes of hope and empathy. Some have taken this to be a spiritual work since the sun/heaven shines upon the boy, his family and the bird. Find coloring sheets and lesson plans from Australian publisher Walker Books.